Instead of a regular review, I’m going to do a comparison for a change. Over the next two software articles, we’re going to compare four of the better known iOS podcast clients on the market today. 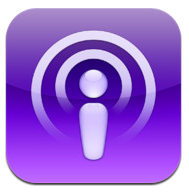 This month, we’re going to look at Apple’s Podcasts and iCatcher. Next month, Downcast and Instacast. To give you an idea of where I’m coming from, when I moved into my studio apartment two and a half years ago, I made it my mission to the cut the cable. Thanks to AppleTV, HuluPLUS and a military-grade HDTV antenna, mission accomplished. I can watch most of my TV shows, sporting events and several podcasts on my 42″ LED HDTV. Yet, there are several podcasts, both audio and video, that I prefer to have on my mobile devices so that I can watch or listen to them anywhere, at anytime. This month, we’re going to review the two apps that I currently use regularly. One I use on my iPad to capture video podcasts, the other on my iPhone to capture audio podcasts. 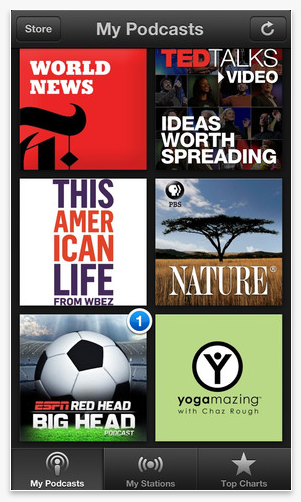 I find that I have different requirements for different podcasts, hence the two apps. To be honest, the podcatcher that I use on my iPad, I’ve been using for years. But, I’m going to look over some of these other clients and see if they can better fit the bill. All of the clients have the same set of controls. To avoid repitition, they are as follows: the standard thirty second froward/reverse buttons (except Podcasts, which only has the reverse selection), go to the beginning/end buttons, the speed control button and edit buttons. This is Apple’s bare-bones entry. I use it as my audio podcatcher. Why? Because I only catch three audio podcasts and my requirements are simple (although this is not to say this is the limit of its capabilities). It has access to a collection of podcasts but the choices, I feel are fairly limited (although you can, of course add your own feeds).The store is that strange ‘program merry-go-round’ that you swipe left or right to pick a category, then swipe down to see your various choices (obviously not a particular favorite UI of mine). The latest iteration is the first to fall to the chop of the skeumorphiism hatchet. Gone is the reel-to-reel tape recorder, replaced with a very simple functions bar. The interface is very simple, cover view or list view. Personally, I find the list layout on the iPad the most appealing (thanks to the extra screen real estate) and the portrait layout easier to navigate on the iPhone. One qualm with this app is that the iCloud refresh on the iPhone seems awfully slow. I regularly have to hit the refresh button twice for whatever reason, while the refresh on the iPad is fine. It’s the same app, so go figure!. Another would be that it’s manual is hard to find. due to the fact, it’s located on Apple’s site. It’s also not very helpful. To find out how to unsubscribe from a podcast, I had to go to a third party site and while they could tell me how to stop the delivery of episodes, they couldn’t tell me how to remove the artwork from my library. Once you learn what you have to do, it’s actually quite simple (irony). Somewhat of a plus is that you can sync your podcasts between iDevices (although you have to download the same podcast to both iDevices and wait a long time for them to sync up). A downside, however, is that you can not subscribe to podcasts that require a password prescription. To get these, you must manually connect to your desktop and engage iTunes. Also of note, you’ll find a button at the bottom of your screen, “My Stations.” Think of it as “My Playlists” and you’ll know exactly what to do. 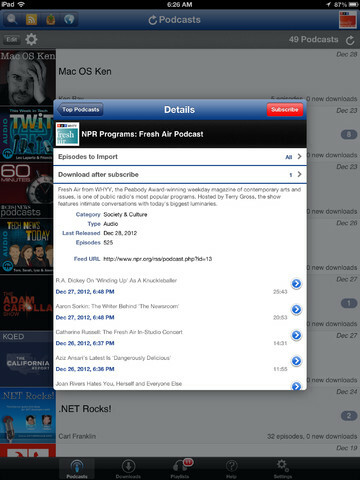 You can keep track of what episodes are downloaded for each podcast, how many are in the queue and download settings. I use this app on my iPad to capture some of my video podcasts (the rest I get through my AppleTV). This is my choice because this is the podcatcher I started with and I haven’t felt that I needed any app that provided more features. Downloads is self explanatory, as are playlists, help and settings. There are also settings for separate audio and video podcast playlists. You can change the play speed by pressing the speed button, or swiping up the screen to increase speed and swiping down the screen to decrease speed. There’s support for password proteçted feeds, support for AirPlay, episodes/podcasts/playlists data sync via iCloud (although, like Podcasts, you have to download the same podcast to both iDevices and wait for them to sync up) and numerous other features. So, that’s it for part 1. So far, it boils down to this; for me at least, Apple’s Podcaster fits my audio workflow, as my only demand is that it plays the podcast that I select. My needs are extremely basic for audio podcasts, ergo, my requirements are. As for the video, I find a few features of interest in Podcasts that may satisfy my needs and help me work my podcatchers down to one client. But not being able to download subscription podcasts, such as ScreehnCastsOnline (second hint, second hint) is a dealbreaker. 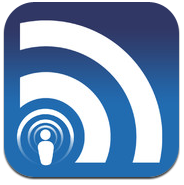 Next month, we’ll move on to two of the more popular podcatchers: Downcast and Instacast. This entry was posted on Monday, July 1st, 2013 at 8:56 pm	and tagged with Apple, Apple software, iOS software, iPad, iPhone, Mac software, YMPNow and posted in Reviews. You can follow any responses to this entry through the RSS 2.0 feed. Sorry, didn’t catch that. Yeah, if there charging that much, I’d personally go with Downcast. Thanks for pointing that out.